There’s a new trend in the movies happening that I’m fond of. These throwback-to-the-80’s movies are now, instead of being self-aware parodies that mock a specific genre and lay on some goofy and ironic thrills, the filmmakers emulate the style faithfully and load the soundtrack with great, great music (and sometimes they soundtrack itself is a work of art). Before this, there was Drive. Before that, there was The House of the Devil. And now, there’s The Guest which carries on the tradition and blends multiple genres into one thrilling movie that blurs the lines between comedy, horror, action and drama. Dan Stevens stars. He’s probably best remembered as Cousin Matthew on “Downton Abbey” but his portrayal of David couldn’t be any different. He’s a well-spoken polite soldier who has been recently discharged from the service and is making good on his word to his Army buddy that died that he would tell his family how much they meant to him. But, as it seems, David’s nice-guy attitude is a little too perfect and he’s hiding a dark, dark secret. In any other movie (and even in this movie), where that goes is unbelievably formulaic and predictable. Someone will inevitably find out and his goofy charm will slowly turn into malice. Sure, that’s true here too, but The Guest knows that the twists are half the fun and embraces each new act in the story with such glee, it’s impossible to not have a blast. People seem to forget that the films made by Alfred Hitchcock were fun. I’m not saying The Guest should be compared to the Master’s highest works, but when something nowadays is referred to as being “Hitchcockian” it’s a suspense-filled exercise in such self-seriousness that it begins to border on boredom. If you’re going to create a story that is driven by its commitment to tension, just remember that Psycho had a first act switcheroo and turned into a horror movie out of seemingly nowhere, North by Northwest climaxed with dangling from Mount Rushmore, and Rear Window was funny as hell. And so, The Guest has a lot of ideas—some simple and some grand—about how to make an audience jump, and most of them stick. 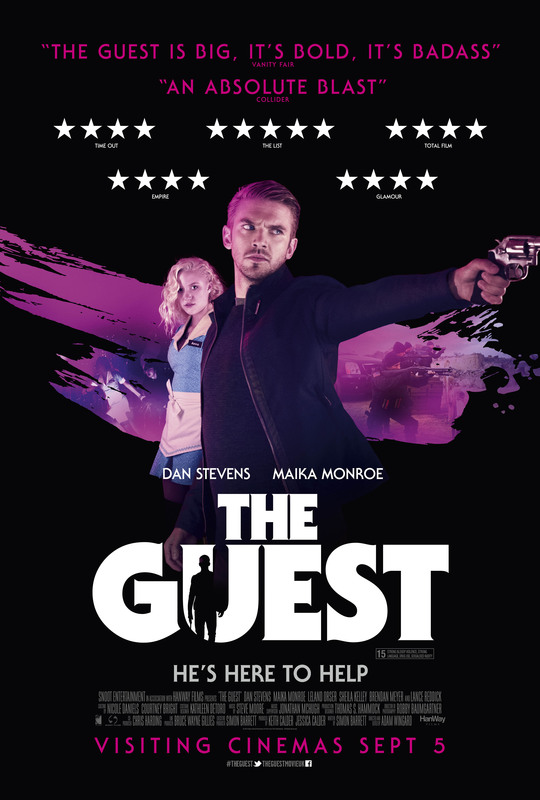 The Guest was directed by Adam Wingard and written by Simon Barrett who were also the writer/director team behind You’re Next, a movie I almost enjoyed, but thought was marred by being too goofy and referential and not enough its own movie. This time around, their craft seems to be more honed. It’s probably just as referential as You’re Next and as intentionally derivative, but this outing is more focused on what it wants to accomplish. A.A. Dowd of the A.V. Club compared The Guest to The Terminator, Halloween and Drive. I would add to that list: Universal Soldier and The Stepfather. The thing is, though, that it never seems like a mess. Every silly little twist is so well executed and it moves so fast that you only have time to process it as the next logical step in the story. The supporting cast are all great, but the true star is, deservedly, Dan Stevens. He pulls some incredible performance range out of his character, and in one small dialogue scene, he’s charming, funny, absolutely terrifying, back to being fun again and then a calculated sort of evil—and none of it feels strange to watch. It’s a remarkable merging of writing, directing and acting. Watching some of the more basic elements and how well they’re handled is like seeing filmmaking 101 on display without any sort of pretension about it. Also, go out and get the soundtrack. Is not quite as good as the one in Drive, but it’s really damn close.